Pioneering vertical dance group, BANDALOOP, brings their dynamic performance art back to local walls this weekend for Arts Council Santa Cruz County’s annual two-day river arts festival, Ebb & Flow. BANDALOOP merges intricate choreography with innovative rock climbing technology, creating work that re-imagines dance and changes the perspectives of international audiences. Based in Oakland, CA, under the artistic direction of Amelia Rudolph, the company educates, trains, and tours locally and abroad. 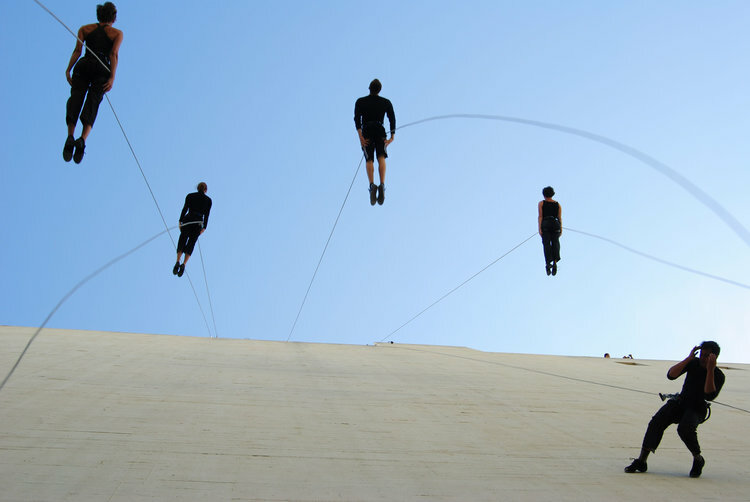 Since its initial launch in 1992, BANDALOOP has performed in over 22 countries for millions of people. Connecting with community, celebrating nature, and activating public space are essential parts of BANDALOOP’s immersive and visionary work, making the experience of their outdoor dance performance a thrilling reflection of Ebb & Flow. Read on for an interview with Melecio Estrella, Assistant Artistic Director of BANDALOOP, and one of the awe-inspiring dancers performing at the festival on June 2, 2018. 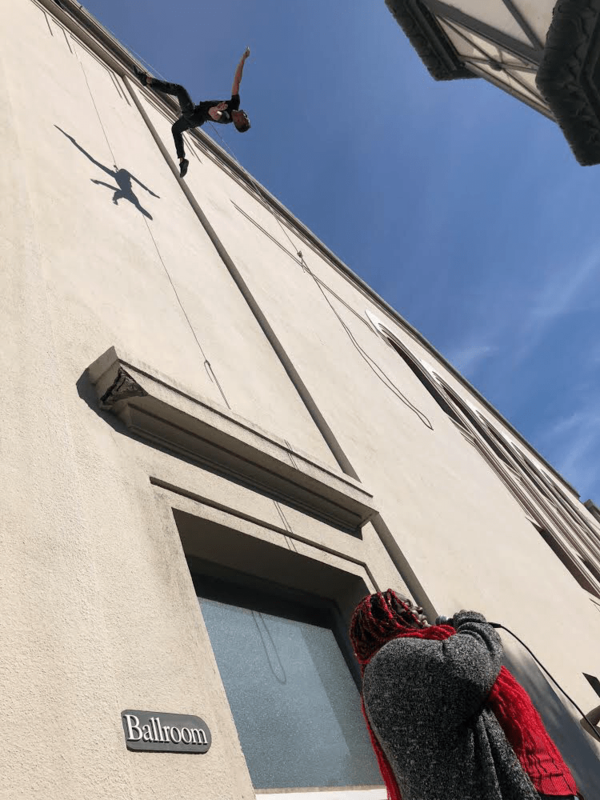 Local Santa Cruz: What inspires BANDALOOP to engage with such diverse collaborations and contexts – performing locally and internationally, indoors and outdoors, and for a variety of events? Melecio Estrella: Part of our mission is to bring dance to new audiences, as well as re-imagining how we activate public spaces and the artful possibilities thereof. These missions drive us to engage with diverse collaborators- whether an arts festival, a fashion line, a building opening, a film project or celebrating natural spaces. We are inspired by people, cultures, architecture, wildness and nature. We play in the nature of the human body in movement, as well as geology, weather patterns, ecology and the wisdom encoded in un-manicured natural settings. What kind of training and experience is involved in the preparation for BANDALOOP performances? We are all professionally trained and practicing contemporary dancers. Beyond that we say the best training for Bandalooping is doing the work itself. While we do cross train with other fitness and strength modalities, the strength that is developed just by doing the work is remarkable. The mental training involved includes an improvisational mindset- being ready to dance with the unexpected elements of architecture and weather, and being able to quickly change and adapt choreography to fit a given site. We also focus a lot on physical, mental and energetic connectivity- being connected in one’s own body, being connected to a dance partner, and being connected to the larger ensemble of the company while dancing. What excites you about continuing to experiment with vertical performance art, and how do you see it evolving? I am excited about the artfulness of exploration and discovery that is made possible by climbing technology. As bandaloopers we have the privilege of putting our dancing bodies where no other humans have danced or will ever dance. In this there is always a sense of exploration and discovery of new possibilities. This kind of work demands sensitivity, playfulness, vigilant safety awareness, patience and grit. All of these qualities enhance our lives in and out of the harness. I see the dance evolving from the creativity that different artists bring to it. When we teach our workshops at our home studio in Oakland (find out at bandaloop.org), we may have a hip hop dancer bringing her urban movement vocabulary to the harness, or we might see a contact improvisor playfully taking his movement form off the ground. Because of the openness of the form and the encouragement to take it to new places, it is growing in many directions at once. My current personal interest in evolving the form is to bring more subtle theatricality and humanness to the work. I am interested in the simplicity of everyday people juxtaposed against an highly unusual site or wall. To me it is this kind of theatrically crafted dreaming that unhinges or excites my imagination the most these days. Please share a sneak peek of the performance BANDALOOP is planning for Ebb & Flow – What can the community look forward to experiencing on June 2? This year we are very excited to collaborate with some local artists, Poet and professor Dina El Dessouky and Company 4 dancers from the Tannery Arts. We are also bringing with us an incredible Artist, Activist, Poet, Singer Tassiana Willis from Oakland. Tassiana works as a performer and spoken word curator with Bandaloop’s current touring work Public Canvas. Audiences can expect provocative words and incredible song in concert with the intimate spectacle of Bandaloop this weekend at Ebb & Flow. BANDALOOP rehearsal in Santa Cruz, with Melecio Estrella (Associate Artistic Director, Dancer) and Tassiana Willis (Spoken Word Artist). BANDALOOP performs at 1:05pm and 2:25pm at the Tannery on June 2. Find the full Ebb & Flow schedule here.